If you thought of mustard when you read today’s blog post title, you have good reason. It was the ancient Romans who originally brought the seeds to France, leading to kings enjoying it on their dinner tables as early as the 13th century. 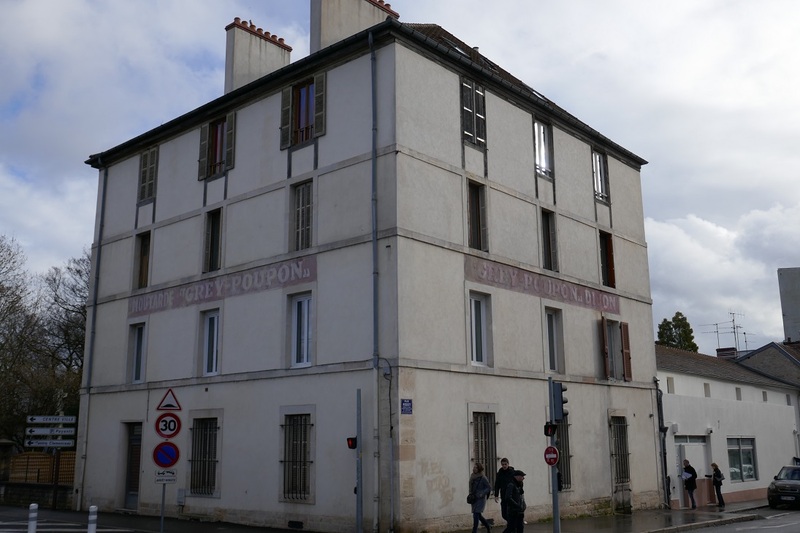 In 1777 businessmen Maurice Gris (Grey) and August Poupon, in their original factory that still exists today in Dijon are credited with creating and popularizing the condiment. 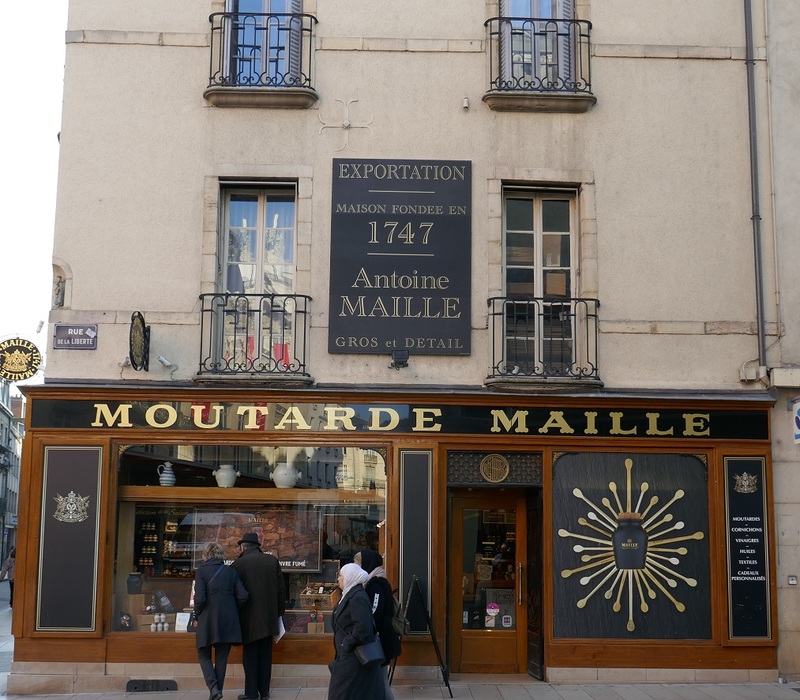 Another well-known brand, Maille, also has its shop in town proudly proclaiming “Founded in 1747”. You might know this area for that hearty stew, bœuf bourguignon, and that bold red Burgundy wine that goes so well with this dish. On our way to northern France we stopped off for a couple of days to see what else the region had to offer. It was about 20 years ago when we were on vacation in Paris that we first visited Dijon. Thanks to high speed trains it was possible to leave the capital after breakfast, spend the day in this city known for mustard, dash over for lunch to the nearby town of Beaune (that’s next week’s blog post) and be back at the foot of the Eiffel Tower for dinner that same evening. Now that we live here and don’t need to make such speedy excursions it was time to give these historic locations the time that they deserved. In most cities we travel to we typically stay in the center of town since it makes it easy to visit most of the historic sites on foot. A logical beginning point, therefore, was the Ducal Palace that has served as a fortress to protect the residents from invaders since the 3rd century. It’s been renovated many times including a Baroque update in the 17th century by an architect known for his work at the Palace of Versailles. It now serves as city hall but the building is so massive there’s plenty of room to house one of the country’s largest art collections in the Museum of Fine Arts that’s been welcoming guests since 1799. 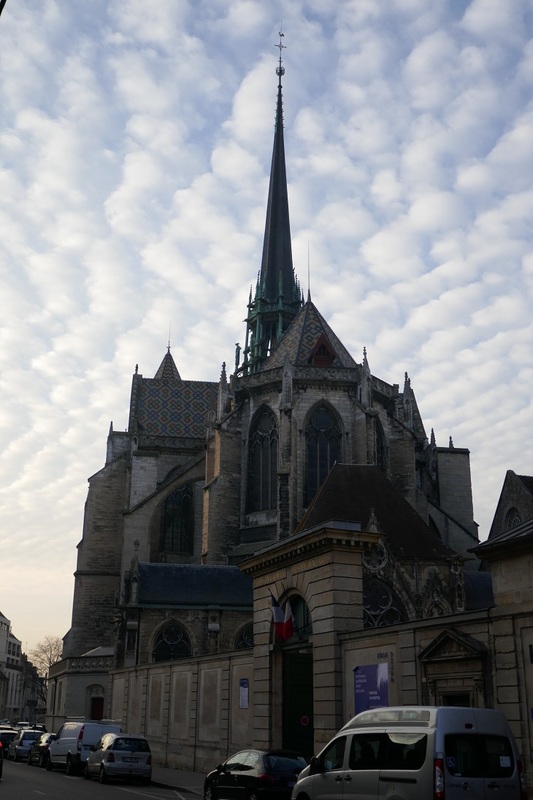 Less than a minute’s walk from there is the church of Notre Dame, begun in 1230 with the facade covered in 3 rows of gargoyles. It was another 150 years before they added a bell tower where large mechanical figures strike the bells. A highlight inside is a wooden sculpture, the Black Virgin, carved in the 11th century while back outside we saw another carving “only” 300 years old that’s been bringing luck to the city since then. Unfortunately, this poor owl’s face is no longer apparent because that’s the part you are supposed to rub to bring good fortune upon yourself. Bronze plates with a much clearer representation of the bird are embedded in the sidewalk to designate stops along the self-guided tour around the town, the Owl’s Trail. We both like museums in general and the kind that I find especially interesting are those that highlight what life was like during different centuries in the city where we’re staying. Inside a former monastery, the Museum of Burgundian Life uses furniture, household equipment, clothing and other items to depict everyday events from the 18th to 20th century. One floor recreates a street full of shops that transport you back in time. Well worth the entrance fee of “no charge”! 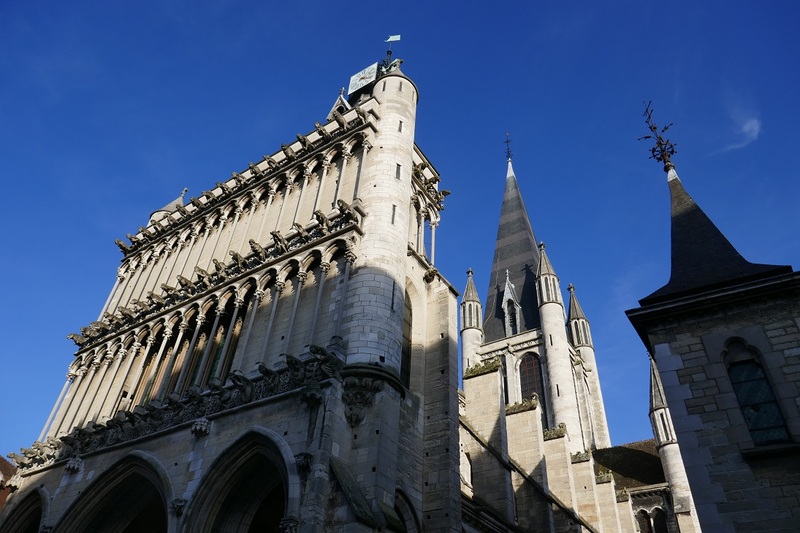 In 1137 a fire destroyed much of Dijon including a 6th century abbey that was replaced, beginning in 1280, with the Cathedral of St. Bénigne that incorporates parts of the original church and houses the crypt said to contain the remains of its namesake saint martyred in the 2nd century. Right beside the cathedral, in part of the former abbey is the Archeology Museum that displays local finds from prehistory up to the Middle Ages. There are 3 floors of exhibits that include a Bronze Age set of gold tableware and the ancient solid gold Rochepot bracelet that weighs 2.8 pounds (1.3 kg.). One street that combines history, shopping, sidewalk cafés and restaurants, along with all the visitors wanting to see this gem is Rue des Forges, right beside the Ducal Palace and Tourist Office. 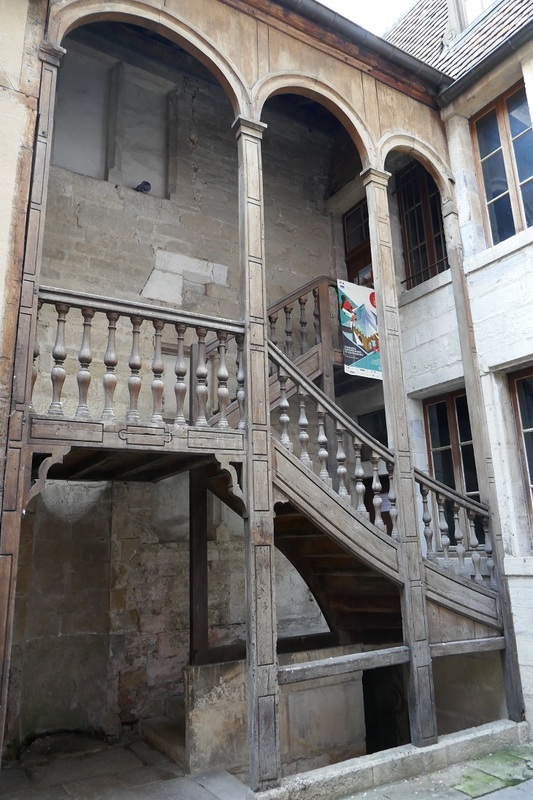 Private mansions are called hôtels particuliers and there are many to admire, especially Hôtel Chambellan with its carved gallery and spiral staircase constructed beginning in the 1400s. Around the corner from there on Rue de la Chouette is the 17th century Hôtel de Vogüé with a noted courtyard, garden, and entrance. Its multi colored and patterned tiled roof is a typical style in Burgundy. 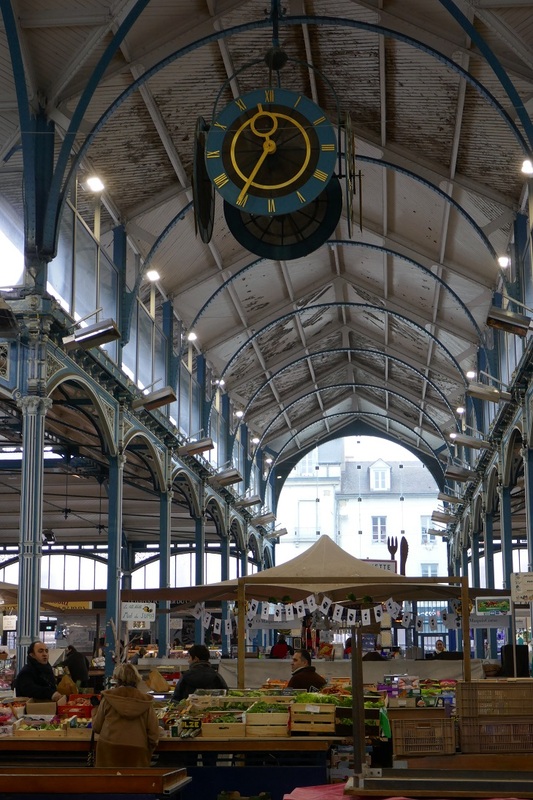 If you don’t find something to eat on Rue des Forges, it’s not far to Les Halles, one of the largest covered markets in France with over 200 stalls plus countless eateries around it. Those inclined to make one of the local specialties such as coq au vin or boeuf bourguignon will have no trouble in finding the ingredients. If you’d rather have someone else do the cooking and to sample the range of wines from Burgundy or the crème de cassis liqueur distilled here, restaurants abound. 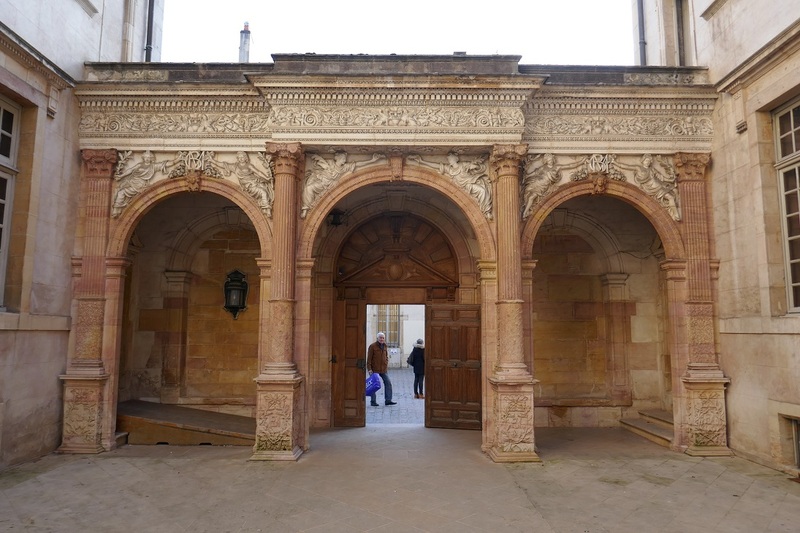 Speaking of regional wines, the city of Beaune is known as the capital of Burgundy wines and since it’s only an 18-minute train ride away from Dijon, we just had to go. More on that next time. 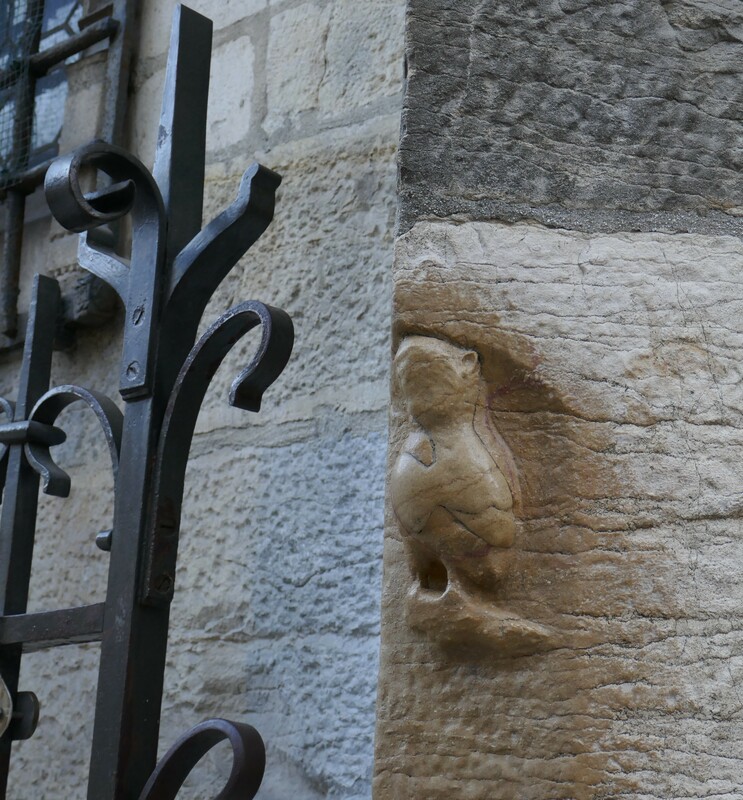 Posted on February 17, 2019, in Life in France, Travel in France & beyond and tagged Americans in Carcassonne, Markets. Bookmark the permalink. 2 Comments. Excellent post guys. Every week we read about your latest adventure. And every week we say, dang, another place to add to our list of places to see. I know we’ll never catch up to you but we are going to try. I remember the adverts with the guys in the Rolls Royce asking if the other driver had any grey poupon. Never knew it was the names of the two founders. We always learn something new with your posts. Look forward to the next one.